By: Craft Marketing Connections Inc. 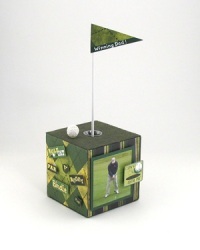 Perfect for the golfer in your life, decorate a foam cube with golf-inspired scrapbook paper and photos of Dad hitting that hole-in-one. This craft is great for kids, though Mom will need to help with the cutting. This is a great Father's Day gift. Plan placement of scrapbook papers around cube, repeating one of the papers on one side. Cut papers into four 5″ squares. Use glue stick to attach to each side, leaving top and bottom side uncovered. Use cardstock for mounting any photos to be used on cube. Cut felt into two 5″ square pieces. Using glue stick, attach one square onto bottom of cube. Set aside other square to attach later. Trace around top edge of cup onto top center of cube. Using serrated knife, cut inside traced hole and remove enough foam for cup to fit inside. Cut one ball in half and glue into cup with tacky glue. Use glue stick to attach felt square onto top of cube. Use scissors to v-notch felt to allow felt to wrap around edge and fold down inside hole. Place cup inside hole. Paint dowel and ball with white paint. Let dry. Cut 1 1/2″ x 3″ flag from scrapbook paper. Cut a larger 2″ x 3 1/2″ green cardstock flag. Use glue stick to mount scrapbook paper flag on green flag with tops aligned, leaving green cardstock stripe at bottom. Write on green stripe with marker, “Winning Dad!” Attach flag to dowel. Insert dowel into foam ball in cup. Remove, apply tacky glue and reinsert into foam ball in cup. Use tacky glue to attach ball to felt on top of cube. Use dimensional circles to attach golf words and photos around cube.